When organizations and/or businesses think about travel safety, they tend to focus on foreseeable threats such as crime, health issues, or unsafe working conditions. Even though natural disasters can come about quickly, organizations can prepare their people in the basics of travel safety. The superstorm Typhoon Haiyan, which recently made landfall in the Philippines, is a recent example. Even though the Philippines had less than a week to prepare for this Typhoon, there were steps business travelers could have taken to increase their travel safety. On November 7th, Typhoon Haiyan began to make landfall in the Philippines. One of the most powerful storms ever recorded, Typhoon Haiyan’s winds reached as high as 175mph and produced 40-foot waves. Many parts of the Philippines were left absolutely devastated by the storm. Although the search for survivors continues, officials fear that Typhoon Haiyan may have left as many as 10,000 dead in the Philippines. In addition to the humanitarian devastation in the Philippines, Typhoon Haiyan has also caused quite a bit of economic damage. Many airports are still closed leaving many travelers stranded. Furthermore, many ports in the Philippines have been damaged by the typhoon, dealing a large financial blow when it is least needed. Large storms such this typhoon provide more lead-time than other natural disasters such as earthquakes. Even so, the Philippines had less than a week’s notice to prepare for Typhoon Haiyan, meaning many travelers were unable to evacuate in time. That is why business travelers should understand how to prepare for and survive a superstorm like Typhoon Haiyan. Modern storm tracking is accurate and the information about a storm’s intensity is widely available. As with any political evacuation, often the safest course is for executives to consider leaving the area while transportation remains available. It is important to know that Typhoons and Cyclones are essentially the same as Hurricanes. The term “Hurricane” is simply the name used for storms in the Atlantic while “Typhoon” is used for storms that originate in the Pacific. This is an important point because preparing for a Typhoon is essentially the same as preparing for a Hurricane — something many people living in the American Southeast are accustomed. 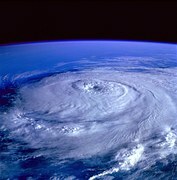 However, business travelers will often encounter Typhoons in places that they are not familiar with. That is why an essential component of travel safety is to always know the area. Particularly, business travelers should know how to quickly locate law enforcement, medical, and transportation facilities. Have an emergency kit with five days of food and water, a hand crank radio, flashlights, and plenty of batteries. All electronic items should be elevated and unplugged. If there is a significant threat of flooding, the electrical mains should be switched off. Windows should be boarded up, and all outdoor items (deck chairs, potted plants, bicycles) should be moved indoors. During a Typhoon, travelers should seek shelter in the interior of a building away from windows. Those residing in high-rise buildings should try to stay in a protected area below the 10th floor. This is because wind strength increases at greater heights. During the Typhoon, individuals should listen to the radio for important safety and weather updates. After the Typhoon passes, business travelers still need to be cautious and heed the directives of public safety officials. Normally, residents are asked to stay in their homes in the initial hours following a storm. Individuals should not walk or drive through flooded areas as these could be contaminated. Tap water could also be unsafe to drink and should be avoided until authorities have a chance to determine its potability. The IMG Group is a leading firm in international travel safety. Corporate or business organizations concerned about their need for detailed and robust travel security planning can reach out to the IMG Group for assistance. The company’s expert security consultants provide services such as executive, employee, VIP, and expatriate travel security, risk and threat assessments, workplace violence prevention, crisis management planning, and more. Previous Post IMG Suggests ‘Must Check’ sites for foreign travel.